Tukar cerita pulak. Kelmarin adalah hari terakhir beberapa colleagues kerja dgn kami sebab diorang ambil VSS. Memang sedih. Salah seorang daripadanya ialah Roana! Dia ni kawan minum, kawan mengutuk, kawan mengumpat, kawan ketawa dan kawan menangis saya. Sedih sebab saya tidak berpeluang berjumpa dengan dia di hari-hari terakhir dia bekerja. Dia janji dia kerja sampai friday. Rupa-rupanya she was on MC for two days. She was always on my thoughts yesterday. I didn't call or sms her coz I know I'll cry huwarggghhh. Hopefully saya dapat jumpa dia di lain hari. To you Roana, I wish you all the best and good luck on your future undertakings. I hope the decision you've made is the best for you. 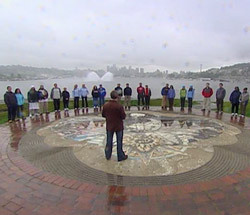 The Amazing Race is Back!!! My favourite RACE is back! What made me excited was when Phil Keoghan said "you think you know this race but I warn you, there will be many surprises - expect the unexpected!" When Phil announced "the world is waiting" then the Race begins. They started the Race from the Emerald City of Seattle, Washington and travelled all the way to Beijing, China. Their first roadblock was in the Gold House Restaurant where the teams have to indulge fish eyes hmmm yummyyy hehehe. From there they need to go to Forbidden City to find a kiosk and grab 3 departure times. This is where I saw the sign 'Last Team'. I suspected something 'fishy' was going on. The teams kept on arriving one by one. The last team to arrive was Bilal & Sa'eed. Then Phil and the magic mat appeared :) When Phil announced that Bilal & Sa'eed has been eliminated from the Race the bestfriends' team argued that it was not a pit stop yet. Well as Phil said in the beginning 'expect the unexpected'. Next, the team's first Detour was to choose between labour or leisure. Most of the teams chose labour where they need to lay bricks on a sidewalk. In leisure, cheerleaders Kellie & Jamie and boyfriends, Tom & Terry participated in an exercise known as Taiji Bailong. After completing the Detour task, the teams were heading to the first Pit Stop at Juyongguan. It was not an easy to reach the Pit Stop as they have to use a rope as their ladder to scale a wall. Models and friends Tyler & James reached at the top of the wall and they proceeded to step on the mat where Phil was awaiting. 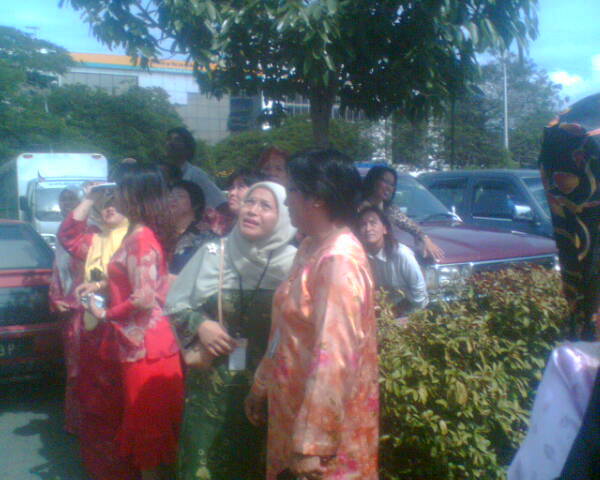 They won USD20k for being the first to arrive. The last team to arrive was the Indian-American couple, Vipul & Arti. They were the second team eliminated from the Race. Couldn't wait for the next episode. Last season, I picked Mom and Daughter team (Wanda & Desiree). This time, I think I'm gonna follow Father and Daughter team, Duke & Lauren! Stay tuned on AXN every monday at 9.00pm for the next Amazing Race 10! Konon2 hari ini (22nd September) is my birthday. Hmmm tua sudah ni hehehe. Nothing much happened tapi apa yang buat sia happy ialah kawan-kawan terus menelefon, menghantar sms, e-mel, tinggalkan message di blog sia, posting wish di YG linda_af dan tidak kurang juga yg wish saya in person. Happy gilaa ni! Mo share sikit apa yg terjadi ni. 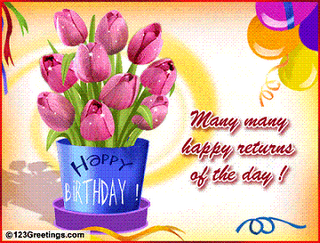 The day before my birthday (21st Sept), on my way to work, my miring friend hantar sms wishing me happy birthday. Adehh betul2 miring dah tu hehehe. My fren tu mesti Terlalu Siok sama Udui sampai my birthday pun lupa2 ingat. But it's ok I don't mind at all. Lagi bagus ada orang kasi ingat my birthday is approaching. Upon reaching office, saya terima another sms from Libbie wishing me the same. Uishh this time saya betul2 tergamam. Saya terfikir sekejap 'is today my birthday?' sambil2 tengok kalendar. Manalah tau saya yang tersilap :) So, saya pun balaslah sms my fren tu. I thanked her and at the same time bagi tau birthday sia sebenarnya on the 22nd hehehe. Wahh Libbie bilang dia ingat that day was already 22nd. Rupa2nya dia mmg tahu birthday sia on the 22nd cuma dia tu tersilap haribulan. Hmmm memang kawan2 sia ni miring-miring ni hahaha jgn marah ahhhh. Pada mulanya on the 21st nite tu sia mo online dgn kawan-kawan. Tapi tidak jadi sbb I watched 'Supernatural'. Bila habis tengok, sia mengantuk teramat sangat so I went to bed lah. Early in the morning, I checked my hp ada message from Dora. Thank you Dora! Then, seperti biasa sibuk preparing pigi kerja. My sons wished me while taking their breakfast. I love you too bebehh! Sampai di office, buka PC ada email from Dylla all the way from JB. Thank you Dylla and take care of yourself. Next, came sms from my sister. Thank you Syl with prayer. An sms from KL came in and it was Jackie. 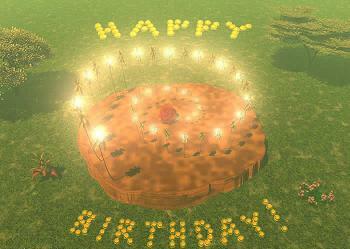 Thanks Jackie for the cake! Lagi sms from my younger sister. Thank you DD and kiss Xanderu for me. And then came sms from my daughter. Dia ni pelik sikit, hantar msg secara terbalik. Nyaris sia tidak faham. Thanks Wen and I love you too! Wah..my morning sibuk dgn membaca sms saja. Tidak sedar2 sudah pukul 9.30. Si Roana bawa minum awal pula. Bah keluarlah kami pi minum di Equity. Maybe this will be our last minum bersama sebelum puasa. Since it was my birthday, saya belanjalah diorang bertiga - Roana, Ros and Lan. Thank you for the 'salam' my frens. Nasib baik korang tidak nyanyi di kedai hehehe. Sambil minum, masuk lagi satu sms. I don't usually bring my hp pigi minum tapi that day macam saya rasa I need to bring :) It was Cintakita. 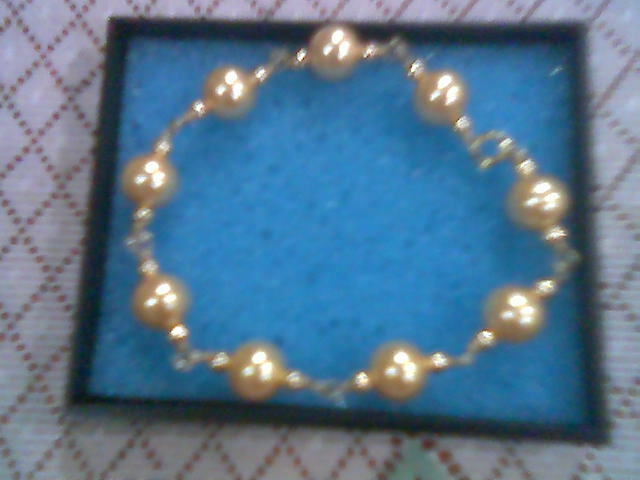 Thank you my dear fren Cinta! Balik from minum, check email aikk ada email lagi dari Cintakita. Thanks Cinta..berapa kali dah mo wish hehehe (tapi dlm ati ckp, I likeee). Then my phone rang. Mula2 orang tu menyamar tapi last2 dia nyanyi happy birthday. Adoiii...it was Cintakita lagi. Memang breaking recordlah dia ni. Belum pernah2 orang buat. Tiga kali wish dah. Cinta bilang dia mo cipta record wish sia sebanyak 4 kali. Kira punya kira bukan 4 tapi 5!! 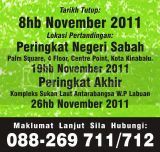 (sms, email, call, blog, YG) . Cayalahhh Cintakita...muahhhsss you are the best hehehe. Around 3pm my phone rang again. The most awaited phone call actually. My hubbylah siapa lagi. Ish ish ish apsal lambat wish ni. Tapi tidak apa as long as dia bagi hadiah and belanja dinner diampunkan hehehe. Bah thank you sinavaan, I love you too! My sister in law's sms came in around 4pm. Thank you Jane and sorry to say, you were not the last hehehe. Then my brother call. Thank you taiko, nanti sia belanjalah! Balik rumah, rehat kejap then mandi. Tidak payah masak sbb ada orang belanja :) My anak-anak semua mo makan pizza sbb pizza is their favourite. So kami pun beredar pi Pizza Hut di Jalan Lintas. Yummieee nyamen sedap. Sedap kerana bukan saya yang bayar muahaha. Sedang kami menikmati makan malam, three sms masuk. Thank you Mat, Eli and Tica. Macam korang ni berpakat-pakat saja. Hantar sms serentak! Kami balik just in time mo tengok One in a Million grand finale. Ritt, amacam? Menang si Suki hehehe. Selesai OIAM, sia bersms kejap dengan Ritt. Then sia pun pi tidur. This year's birthday is the best so far. While typing this, I received one last belated wish from Nasgurl. Thank you El walaupun ko sibuk di sana sempat juga ko wish sia dan tidak sah kalo nama Udui tidak disebut hehehe. So that's it. Whatever happened on my birthday, it is still fresh in my memory. I jot it down here in my blog so that when years passed by I can always refresh my memory that I do actually have loving family and friends. Thank you guys for making my day and may God bless us always! Huhuhu...sia termimpi lagi Linda jadi cover magazine Seventeen hehehe. Saya ni terlalu banyak angan-angan untuk Linda. Rindu teramat sangat bah ni. Apa-apapun, terubat jugalah rindu bila tengok Linda nyanyi di Stadium Likas sempena penutupan bulan kemerdekaan peringkat nasional. Lirik di atas merupakan sebahagian lagu yang disampaikan oleh Linda berduet dengan Marsha semalam. Ianya seperti satu message dari Linda bahawa dia merindui peminatnya dan juga satu soalan dari Linda samada peminatnya masih merindui dirinya. Adoii Linda..saya sentiasa merindui dan setia menunggu kemunculan kau. Harap-harap kemunculan pertama semalam merupakan titik permulaan untuk Linda kembali ke persada seni dan kembali ke pangkuan peminatnya. 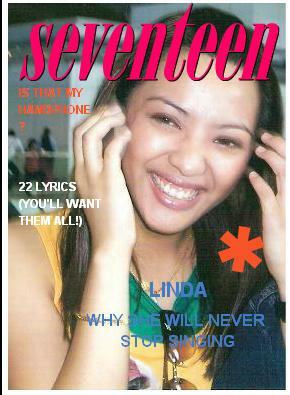 I miss you so much, Linda! 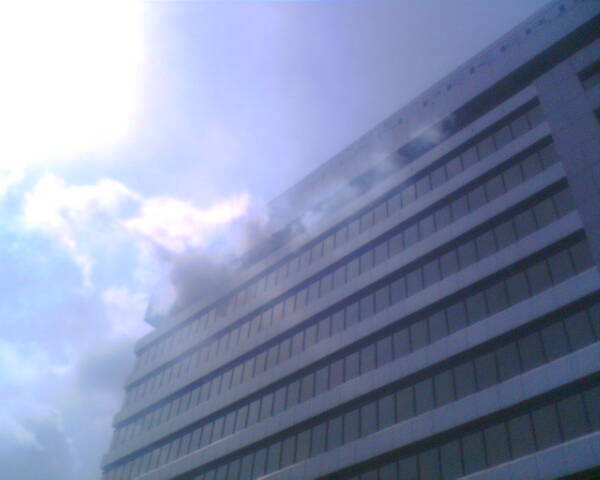 Our Office on Fire !!! Pukul 9.30 pagi kelmarin, tiba-tiba fire alarm berbunyi. Eh eh ofis kami kebakaran! Ooooh tidak. Terdengar announcement, it was a fire drill. We need to get out from the building. Aiseyman..with high heels kena turun tangga dari tingkat 7 pula tu! “I competed hard… I played my heart out. 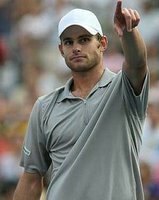 I’m disappointed but proud of the two weeks I had here”, said Andy Roddick. Well Andy, I'm disappointed too but still happy when you reached the finals. Good luck to you in your next game! Congrats to Federer for winning the title for the 3rd time. 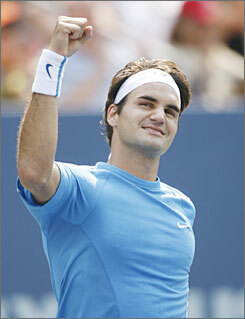 He outlasted Roddick, 7-6(5), 4-6, 7-5, 6-1. He is still the world no. 1 and currently nobody can stop him for being on the top. 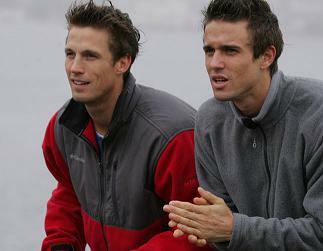 That's the end of US Open 2006! 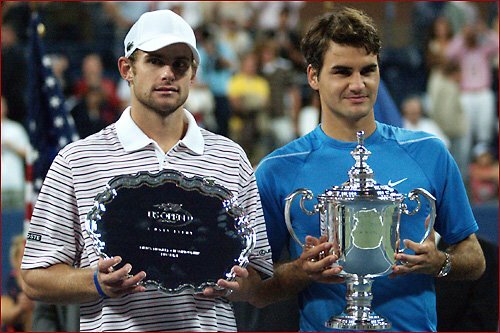 It would be Roddick vs Federer in the US Open Finals 2006. Who will win the title? The last time Roddick won was in 2003. Federer is trying to win his third straight title in New York. 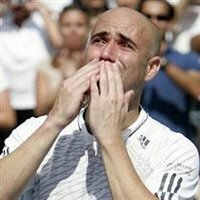 I hope Roddick can stop the world no. 1. Good luck Andy! “The fans’ support means the world to me,” Andy said in his courtside post-match interview. “Thanks for backing me up.” The fans were more than happy to carry their hometown hero into tomorrow’s finals as Andy and Russia’s Mikhail Youzhny displayed some high quality tennis today. Patience, placement, and power were the keys that won Andy a spot in his first Grand Slam final this year, sending Youzhny packing in 4 sets; 6-7(5), 6-0, 7-6(3), 6-4. Andy Roddick unleashed 17 aces en route to a 6-3, 7-5, 6-4 victory over Australia's Lleyton Hewitt in their quarter-finals game. 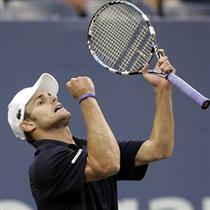 He advance to the semifinals for the first time since winning the U.S. Open, at age 21, in 2003. He will face Russian, Mikhail Youzhny this saturday. 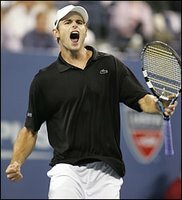 Andy Roddick of the United States pumps his fist during his match Fernando Verdasco of Spain at the US Open tennis tournament in New York. It was not an easy game for Roddick. He took down Verdasco in five sets, 6-7, 6-3, 6-4, 6-7, 6-4. He advances to fourth round. In the meantime, Agassi received a long, thunderous ovation and thanked the fans for their tremendous support. He announced earlier this summer that he would retire after the Open, which he won twice and finished second three times. He leaves with eight Grand Slam titles and a sore back after two decades on the tour. Jika Kau Kekasih di Carta 30 HotFM - Dahsyat! Saya sudah lama tidak update Carta 30 di HotFM. Keadaan tidak mengizinkan hehehe maksud saya, saya tidak dapat mengikuti sepenuhnya carta 30 ini sebab sering ada masalah. Apa-apapun, pada hari ini saya dapat mengikuti carta 30 ini tanpa sebarang gangguan. Apa yang pasti lagu Velvet dan Lotter menduduki top 30. Boleh tahan juga diorang ni. Baru keluar dari AF4 lagu diorang sudah meletup-letup di radio. Tapi bukan lagu diorang yang saya tunggu hehehe. Saya masih setia dengan lagu Linda Nanuwil. Bila Farah Fauzana umumkan lagu menduduki tangga ke-21 saya terus tersenyum sebab saya dah boleh agak lagu JKK mesti ada peningkatan. Then, diorang umum lagu JKK menduduki tempat ke-20. Yesssss. Bangga jugalah. Tidak sia-sia saya mengundi lagu ini dengan penuh kesabaran. Yang paling penting, lagu ini masih bertahan di top 30. Saya juga harap, peminat Linda terus dan terus mengundi lagu ini. Jangan biarkan lagu ini terkeluar dari carta 30. Dan apa yang lebih membanggakan saya ialah apabila Faizal@FBI cakap peminat Linda Nanuwil semuanya dahsyat! hahahaha. Terima kasih Faizal! Kami memang dahsyat. Kami sehati sejiwa demi Udui. Noey, TS, Cath, Ritt, Cinta, Dora, Ziah dan yang lain-lain, teruskan usaha untuk memastikan JKK sentiasa bertakhta di hati kita!